Lewie Coyle has extended his loan deal at Fleetwood Town until the end of the season but the Leeds United full-back is not sure what his future holds after that. The 23-year-old is under contract at Elland Road until the end of next season but is not in Leeds boss Marcelo Bielsa’s current plans. 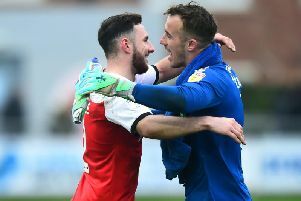 Coyle, who is on his second loan spell and third head coach at Fleetwood, is on course to complete a second full season at Highbury, having made 67 League One appearances for the club. And the defender, who agreed his new deal on the day Town team-mate Kyle Dempsey joined Peterborough on loan for the rest of the season, said of his future: “I just take each game and week as it comes. “As long as I am enjoying football and playing football I am happy. I want to play football week in, week out and keep my level of performance, whether that be here or at Leeds. “I’m aware I have this year and next year remaining on my contract at Leeds. I’m not looking too far ahead at the moment. The Humbersider admits being away from his family has been difficult but says his experience at Town has developed him as a player and a person. Coyle added: “I’m my own worst critic at times but I think I am a completely different player than when I joined last summer. “I don’t think you could be the same player with the amount of games I have racked up in two seasons. “I feel I have come on in leaps and bounds and it is only good for my development personally. “I’m playing week in, week out and gaining valuable experience.